Streisand can sing, but she’s no jazz singer. If love is the answer, Babs should ask better questions. 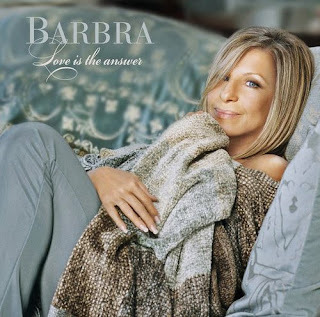 My review of Barbra Streisand’s “jazz” album, Love Is the Answer, went up yesterday at Allaboutjazz.com. On paper it must have seemed like a stroke of genius. Pair Barbra Streisand, the most successful vocalist in the world with Diana Krall, the critically acclaimed and commercially successful jazz stylist, turn them loose in the studio with selections from the Great American Songbook and wait for the magic. Unfortunately, there’s no magic and little chemistry between Streisand and Krall on Love Is The Answer, as the results are more fizzle than sizzle. Streisand is a woman of many talents. An incredible vocalist. An award-winning actress and film director. A political activist and philanthropist. What she is not is a jazz singer. Love Is The Answer isn’t a radical departure from any of Streisand’s albums of the last 20 years. It’s polished, professional and often over-produced to the teeth, with Johnny Mandel’s string arrangements sapping any trace of spontaneity out of the project. Krall takes the producer’s chair and she’s assisted by co-producer Tommy LiPuma, but the only credit that matters is the executive producer–Barbra Joan Streisand–who really calls the shots. That’s a shame, because while Streisand sounds perfectly fine, at 67 her range has diminished; she prefers low energy, undemanding material that can be delivered in a seductive whisper. Nobody ever confused Streisand with Tina Turner, but much of her upper range is gone and her drab, unexciting delivery of this material quickly becomes tedious. Streisand delivers this ballad-heavy album professionally, but without a single up-tempo song among the 13 tracks, Love Is The Answer drags in the middle and seems longer than it is. The bland predictability of Krall’s production (who restricts herself to playing piano) never challenges or inspires Streisand to assert herself. There’s not much memorable here, other than Streisand’s fumbling French on “If You Go Away (Ne Me Quitte Pas)” and noticeably off-key singing on “Spring Can Really Hang You Up The Most.” She fares better with “In The Wee Small Hours,” “Love Dance” and “A Time for Love,” but never makes these songs uniquely her own. The album really suffers from Mandel’s saccharine string arrangements which, since there’s no respite from them, quickly become cloying. Krall’s quartet briefly cuts through the clutter on “Make Someone Happy,” but against Mandel’s relentless orchestral onslaught they don’t stand a chance. Columbia Records is releasing a “deluxe” two-CD edition of the album: the orchestral version on CD1; and Streisand, backed by Krall’s quartet minus the strings on CD2. Those who eagerly anticipated the advertised collaboration between Streisand and Krall will find themselves having to pay extra for it. To promote the release, Streisand appeared for one night only at the legendary Village Vanguard, where she had opened for Miles Davis some 48 years earlier. But Streisand isn’t interested in fully embracing jazz; only dabbling lightly at it. Love Is The Answer is a deeply disappointing album that falls flat as smooth jazz, contemporary jazz, cocktail lounge jazz or, for that matter, anything remotely resembling jazz. Track Listing: Here’s To Love; In The Wee Small Hours Of The Morning; Gentle Rain; If You Go Away (Ne Me Quitte Pas); Spring Can Really Hang You Up The Most; Make Someone Happy; Where Do You Start; A Time For Love; Here’s That Rainy Day; Love Dance; Smoke Gets In Your Eyes; Some Other Time; You Must Believe In Spring. Personnel: Barbra Streisand: vocals; Diana Krall: piano; Jeff Hamilton: drums; John Clayton: bass; Anthony Wilson: guitar; Robert Hurst: bass (1, 2, 6, 11); Tamir Hendelman: piano (1, 2, 6, 11, 12); Alan Broadbent: piano (5, 7, 8, 9); Bill Charlap: piano (13); Paulinho DaCosta: percussion (3, 10). ← Roland Emmerich’s “2012” or “I Like ’em big and stupid”.